I know that many of my friends and colleagues also do yoga. Yoga in studios; yoga on the beach (I’m thinking of you KV in Mexico right now! ); yoga in their living rooms. I took my very first yoga class in 1976 when I was an undergraduate student at Carleton university. In those days the instructor wore a dance leotard, minus the leg warmers, and talked with an eastern european accent. 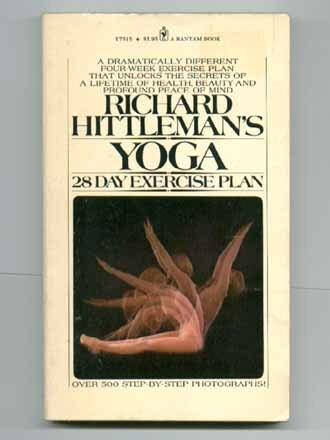 Later I bought Richard Hittleman’s book (anyone remember it?) and practiced yoga on my own in the cramped space of the attic apartment I shared with AW. I still have that book. Over the years I’ve tried other fitness regimes–aerobics, running (that lasted about two weeks), working with weights and treadmills or other cardio equipment in various gyms (thank you PV for teaching me how to not feel like an idiot in the gym amongst grunting guys), power walking, pilates…but I always come back to yoga. When I was going off to Croatia I packed my running shoes and layering, stretchy clothes for power walking. I also downloaded an iPad app for yoga in my living room. I did more yoga than power walking, partly because I was doing so much walking anyway just living my life there. But there was always something about yoga that was super appealing. Now I’ve once again joined a gym near my home, but I still go back to yoga. The sunroom is the perfect spot (it even has heated floors); it’s the shape of the mat; and with downloaded lessons on either laptop or iPad I get a “class” right at home. And I don’t have to buy fancy Lululemon wear in order to feel groovy. Ordinary t-shirt and cotton pants work just fine. Is there something about yoga that particularly suits the academic life? Maybe. It appeals to the detail oriented part of me. Get in precisely that position. Place the weight on that toe. Breathe in when you move like this and breathe out when you move like that. I also like its simplicity. No gear or gizmos required, really. No expensive and ugly shoes. You can work with props, but all you really need is a mat. In a pinch, a towel or two on a carpeted floor also work. You can work with partners, but you don’t have to. It can be a solitary experience, which we academics are so used to. I like the focus it brings to the body and mind. It is both challenging and relaxing, and that oxymoron appeals to my LitCrit brain. It is quiet. I’ve never tried either speed yoga or hot yoga. They seem to me perversions of what yoga is all about. Precision, calm, gentleness but also a reaching. Reaching for what? That deeper settling into the pose. That deeper stretching of muscles. That deeper strengthening of the joints. In my middle years, yoga is the thing for me.